Joy to the curls, soirée season is here and Blo Blow Dry Bar is here to help! 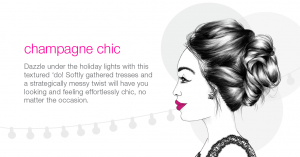 Since it’s the season of flawless hair, there’s no better time to turn heads and make an entrance then at the next holiday soiree, whether it’s a festive office shindig, an ugly Christmas sweater party or a glamorous New Year’s bash. And, as always, Blo has the holidays covered with a new hair menu including three signature blow out styles to make this a hair affair to remember. Dazzle under the holiday lights with this textured ‘do! Softly gathered tresses and a strategically messy twist will have you looking and feeling effortlessly chic, no matter the occasion. 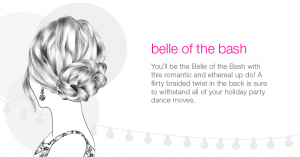 Be the Belle of the Bash with this romantic and ethereal up do! A flirty braided twist in the back is sure to withstand all holiday party your dance moves. 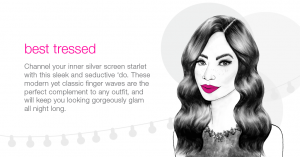 Channel your inner silver screen starlet with this sleek and seductive ‘do. These modern, yet classic finger waves are the perfect complement to any outfit, and will keep you looking gorgeously glam all night long. To book an appointment or for more information, visit bloponce@blomedry.com or call 404-549-3363. 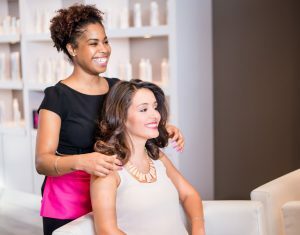 Stay connected on Facebook at @bloblowdrybarponce, on Twitter at @bloheartsyou #bloponce and on Instagram at @bloponce #bloponce. Blo Ponce is located in Midtown Place at 650 Ponce de Leon Ave., Suite 620B Atlanta, GA 30308.